This French toast with cinnamon and brown sugar butter recipe is not your average breakfast! It’s loaded with sweet spices and decadent flavored butter. First, remove the butter from your fridge and set it out on the counter to soften. Next, in a medium-sized mixing bowl or food processor, combine the butter, brown sugar, the one and a half teaspoons of cinnamon. Then, whip or pulse the ingredients until they have combined. You should have a creamy whipped butter. Last, transfer the brown sugar cinnamon butter to your serving dish to use as a topping on your French toast. First, preheat a large skillet over medium heat and spray it with non-stick cooking spray. Next, in large mixing bowl, whisk together the eggs, granulated sugar, heavy cream, nutmeg, ginger, salt, and the remaining cinnamon. After that, dip one piece of Texas toast at a time into the egg batter and place it in the pan to cook for one to three minutes on each side. The toast should be dark brown, and the toast should be dry before removing from the pan. Repeat this process until all the bread is cooked. 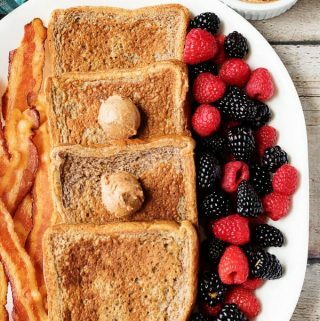 Last, transfer the finished pieces of toast to the serving platter(s) and place one tablespoon of the cinnamon butter and one tablespoon of maple syrup on top each serving. Then devour and enjoy! The calorie count listed is only an approximation based on the ingredients in the recipe. Calories may vary depending on personal eating habits and increases in condiments and sides. Please serve French toast while it is warm. It can be stored overnight in your fridge in a sealed container.